We are pleased to be relocating to a new booth at the upcoming NY NOW show. Our incredible, hand made, Ethiopian textiles, unique and lovely Namibian baskets and a fun new line of Namibian ceramic jewelry will all be on display in the main hall of Handmade Global in booth #244. Please stop by and see our new items for the 2016 Spring/Summer season. See you soon. Johnnie and Penny. The lovely French Collection is our newest towel and hand towel offering. We will be taking orders at NY NOW show January 30 – February 2, 2016. 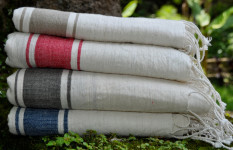 Same wonderful quality as our other collections of towels and hand towels, and made of 100% Ethiopian Cotton. 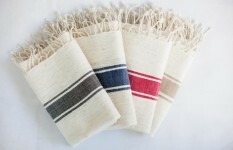 Natural with red, navy, gray or beige stripes. 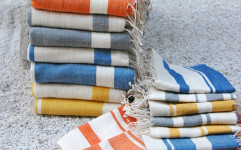 Place your order for our unique, amazing towels, hand towels, table cloths, cushion covers and scarves by tomorrow and receive a 20% discount on your entire order. In stock items only. Whiles supplies last. 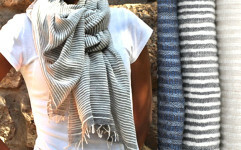 Order by emailing info@wovenpromises.com. 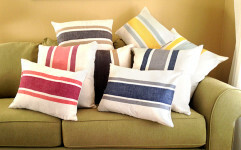 Our cushion covers are made of luxuriously soft Ethiopian cotton and come in two sizes. 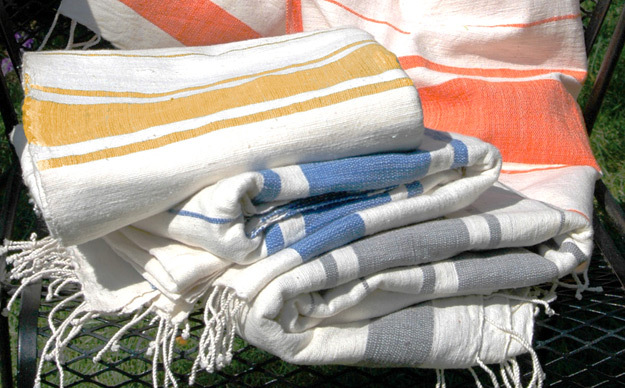 Look fabulous on your couch or bed and pair with one of our matching towel/throws.